The company first sergeant of Headquarters Company, Combat Logistics Regiment 25, 2nd Marine Logistics Group, was awarded a Bronze Star Medal during a ceremony aboard Camp Lejeune, May 5. 1st Sgt. 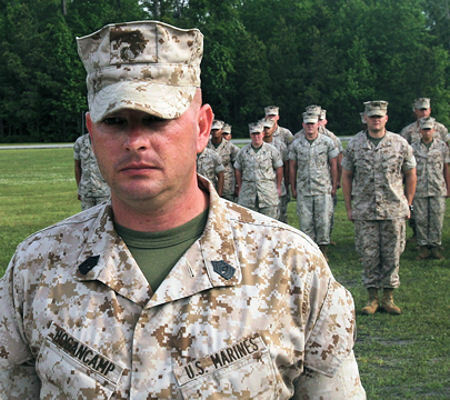 Brian C. Hogancamp, earned the award for his meritorious service while taking part in combat operations against the enemy when he served as the company gunnery sergeant for India Company, 3rd Battalion, 2nd Marine Regiment, Regimental Combat Team 2, while deployed in support of Operation Iraqi Freedom in April 2005. Hogancamp was the on-site commander for the construction of a forward operating base in Husaybah, Iraq, where he assured the success of their mission. Hogancamp led his crew of Marines day and night through constant direct and indirect fire for three continuous weeks. They continuously filled 26,000 sandbags, erected 300 Hescoe Barriers and moved 72 tons of dirt, sand and gravel in order to complete their mission. Hogancamp and his Marines took on a task normally given to a Naval Mobile Construction Battalion, commonly known as Seabees, who provide construction and maintenance support to the Marine Corps, Naval Forces and other military units. With all he accomplished, it was no surprise he earned such a distinguishing award, said 1st Lt. Randy Combs, the company commander of Headquarters Co., CLR-25. Combs also mentioned Hogancamp was a great example for the young Marines in the company and is a person they would want to emulate. Hogancamp led his Marines through constant fire, while continuously maneuvering and positioning himself and his Marines to neutralize and destroy the enemy. His story is one of many that have comprised the Marine Corps' war on terrorism in Iraq and abroad.